I know it will sound like the start of some sort of silly advertisement, but when I first pulled my copy of “Meditation: The Complete Guide” out of the envelope from New World Library I found myself thinking, “Complete guide? We’ll see about that.” Well consider me soundly put in my place because Patricia Monaghan and Eleanor G. Viereck couldn’t have created a more complete resource without shipping actual living meditation instructors to your home. Honestly, the thoroughness of their book would border on ridiculous if it didn’t create such an amazing resource. 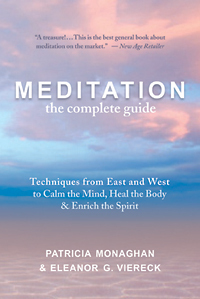 “Meditation: The Complete Guide” begins with an introductory section that discusses meditation in general, why people practice meditation, what kind of meditation practice might work best for you, and more. For those who may be curious, following the suggestions in this section of the book, my top types of meditation practice would be biofeedback and/or Qigong followed closely by Yoga and/or Tai Chi. The rest is divided into 10 parts and you just won’t believe everything to be found: trance dancing, drumming, ritual body postures, Yoga Asanas, Yoga breathing, Yoga meditation, Mantra, Yantra, Vipassana, loving-kindness, Zazen, Zen in action, Haiku, brush painting, Tai Chi, Qigong, the Mussar Movement, Hitbodedut, contemplative prayer, Hesychasm, Taize singing, Quaker worship, Sufi breathing, Sufi dancing, candle meditation, inspirational reading, free-form meditation groups, labyrinth walking, prayer beads, biofeedback, sketching from nature, needle crafts, journaling, dialogues with self, visualization, sports as meditation, gardening, pilgrimage, and nature. Whew! My fingers are exhausted! And each of these things includes a checklist for practice and resources specific to the type of meditation being discussed. I would imagine whether a beginner, or someone with an established practice they enjoy, anyone with an interest in meditation would find “Meditation: The Complete Guide” a valuable resource.